Pennsylvania Station generally referred to as Penn Station is the main train station in Baltimore, Maryland. Designed by New York architect Kenneth MacKenzie Murchison (1872–1938), it was constructed in 1911 in the Beaux-Arts style of architecture for the Pennsylvania Railroad. It is located at 1515 N. Charles Street, on a raised "island" of sorts between two open trenches, one for the Jones Falls Expressway and the other the tracks of the Northeast Corridor. The Mount Vernon neighborhood lies to the south, and Station North is to the north. Penn Station is about a mile and a half north of downtown and the Inner Harbor. 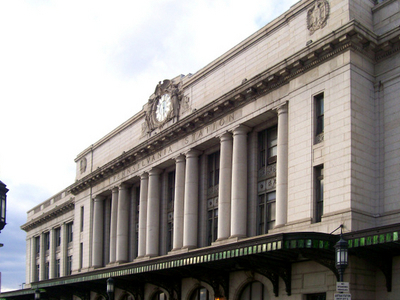 The station was originally known as Union Station (because it was served by both Pennsylvania Railroad and Western Maryland Railway), but was renamed to match other Pennsylvania Stations in 1928. Penn Station is served by Amtrak, MARC, and the Maryland Transit Administration's light rail system. The station is the north terminus of the Light Rail's Penn-Camden shuttle, connecting the Mount Vernon neighborhood with downtown; the southern terminus is the Baltimore's Camden Station. MARC offers service between Washington, DC and Perryville, MD. Here's the our members favorite photos of "Railway Stations in Baltimore". Upload your photo of Pennsylvania Station!